If there’s one thing we can learn in the aftermath of Hurricane Matthew it’s this, everything is replaceable except life. As we clean up our “stuff”, we find ourselves taking inventory of what is truly important and what isn’t. This week we’ll be looking at a very proverbial-like text by Solomon in Ecclesiastes 6:1-7:13. He will confront us with the questions, “Are you satisfied? 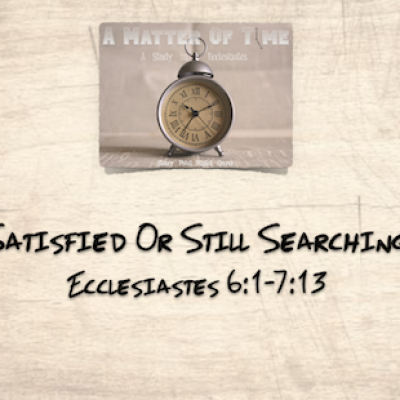 Or are you still searching?” During the morning worship service, we’ll look at 10 things that bring true satisfaction.